Round Five of LPL7 was one of three Theme Rounds; this time the theme was “Historical Civil Wars”. This fits perfectly into my ongoing Russian Civil War project, and was one of the reasons I pushed myself to participate in this year’s LPL. I pulled out some RCW figures that I’d finished very quickly and roughly, stripped them, and repainted them to a much, much higher standard. The main scene depicts a group of raiding Cossack cavalrymen coming around the corner of a village church to find the locals armed and waiting for them, with a big farm wagon pushed across the road as a barricade. 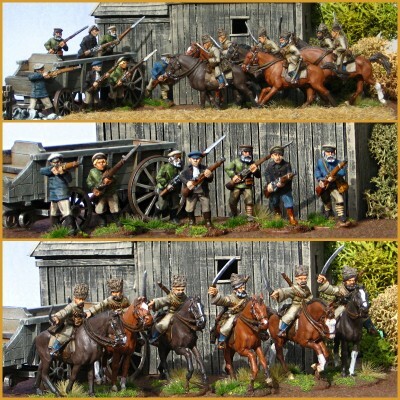 Russian Civil War action – village militia vs Cossack raiders. Click for full size. The local militia are Copplestone Castings Russian Partisan figures; they’re great figures loaded with character. I own twenty or thirty of these guys (at least two packs worth, maybe three, I’ve lost track!) and I have very few duplicate figures in that collection. I pulled out seven favourite poses to repaint for this scene. I painted them up as a mix of young men & old. The young men would likely be returned frontovik (Russian veterans of the Great War) or, if this is a Bolshevik militia, young radical Bolshies come out from the cities. There were rural militias for every political flavour of the Russian Civil War, and quite a lot of no distinct flavour at all — the “Greens”, who were either peasant militias formed for self-defence or anti-revolutionary bandits, depending on who was telling the story! The Cossacks are from Brigade Games. Brigade’s Russian Civil War/WW1 in the East range doesn’t get as much attention as the Copplestone Back of Beyond ranges, but there are some lovely figures in that range, including these fairly recent Cossack cavalrymen. There’s a pack of regular riders with swords and slung rifles, and a command pack with officer, trumpeter and standard bearer; all six of these guys are from the regular Cossack pack. They’re very nice figures, a bit more fine-boned than the Copplestone figures but very compatible. The one downside to these Cossack figures is that some of the details are quite delicate, especially the sabres and scabbards. By the time you read this my Round Six figures will be competing in the LPL; head over to the Lead Adventure Forum to see how they’re doing!